This deliverable contains original unpublished work except where clearly indicated otherwise. Acknowledgement of previously published material and of the work of others has been made through appropriate citation, quotation or both. 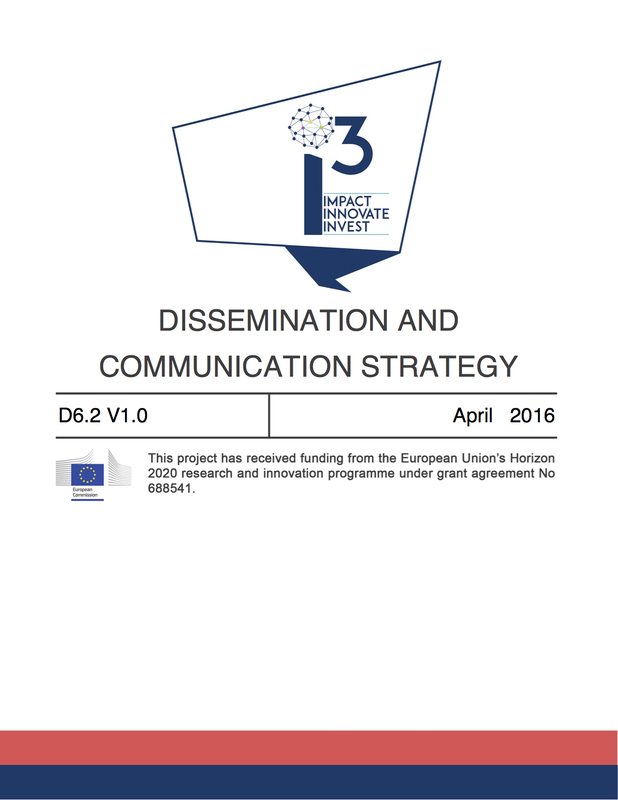 This Deliverable provides a description of the i3 dissemination and communication strategy and plan. 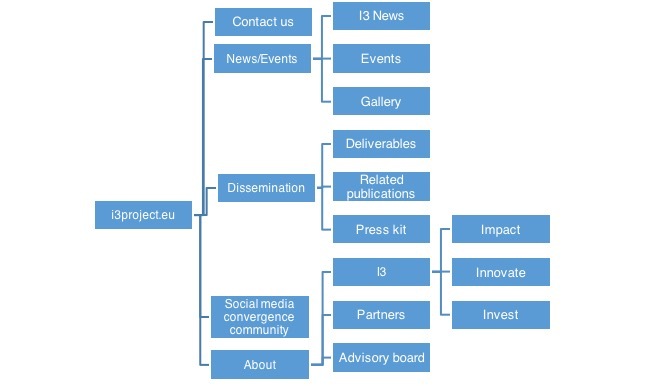 The dissemination and exploitation of the project’s research activities and results are fundamental components of the i3 project, thus a clear plan and strategy were developed for this purpose. The planned activities, and results will be disseminated throughout the life span of the project. In this context, note that this document is meant to be used as a reference tool for all promotional activities for the project by the partners. Updates of the dissemination and communication plan can be made upon approval by the consortium during the implementation process of the project. The dissemination and communication plan provides an overview of i3, defines the target groups that will be engaged, explains why they are engaged and map out the activities. To complement the plan, the Dissemination strategy defines the key objectives for the project’s dissemination. Moreover, the strategy builds upon the defined target groups and stakeholders and elaborates why they are reached. Creating and maintaining the project web site and appropriate communication channels and dissemination tools to the other social media projects and external related communities/activities. Participating in and organizing specific events for increased and effective liaisons, dissemination of information and engagement of key stakeholder in the social media ecosystem. This objective is strictly linked to WP2 with which this WP have clear interdependencies. This Deliverable is structured as follows: Chapter 1 will provide an overview of the project, partners involved and their expertise relevant to the project. Chapter 2 will explore the dissemination plan, define the target groups which this project will engage and select the key messages it will convey to them. Chapter 4 will present the strategy that was developed to achieve the dissemination plan, describe the tools that will be employed to reach the defined target groups. The Annexes provided serve as documents where the reader can get more information about the concept behind the I3 website, projects implemented by the consortium and a list of ICT 19 projects that will be engaged. i3 is a 30 months Coordination and Support Action for “ICT 19-2015. The consortium listed below is made of partners that have significant experience in the area, each one contributing with its own strength to the project’s underlying activities. iMinds is an independent research institute founded by the Flemish government to stimulate ICT innovation. It brings together companies, authorities, and non-profit organizations to join forces on research projects. iMinds unites more than 900 researchers from numerous Flemish universities and knowledge centres. Since its establishment in 2004, iMinds has run more than 250 projects, representing a total value of well over 250 million euro. For this application, iMinds research group SMIT participates, more specifically, the business model and user research teams. iMinds-SMIT, at the Vrije Universiteit Brussel (VUB), is specialized in fundamental, applied and contract research in the area of ICT. With currently a staff of over 65 researchers, and an annual turnover of well over 3.5 M€, SMIT is a major research centre in Europe for policy & socio- economic research relating to ICT and media. SMIT specialises in social scientific research on media and ICT, and combines user, policy and business analysis with both quantitative and qualitative research methodologies. T6 ECO is a consulting and research SMEs with extensive experience in participating and coordinating national and international research and innovation projects. In the last 10 years, T6 ECO has gained a very significant experience in carry on research and management activities in complex research projects, the most of them funded within the EC Research Framework Programs. What makes T6 ECO different is the idea to bring together Project Management and Scientific Research, where Project Management is a mean to support the “knowledge society and economy”. In this framework, among T6 ECO main activities we like to mention: strategic consultancy to Public Administrations and private enterprises regarding innovation of process and use of ICT technologies, IT research on Digital Ecosystems and Distributed systems, software technology transfer, business support for IT access and adoption by SMEs and socio-economic impact assessment of research and innovation investments. F6S Network Limited is a UK based entity that is the largest social network for Startups in the European Union. With over 1.2M profiles for the Startup/SME community and more than 400,000 Startups, it currently supports the majority of the Startup/SME ecosystem through deal flow/applications, jobs listings, free services, communication forms and other areas. 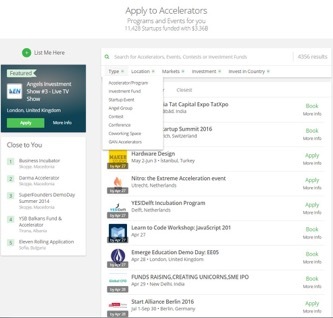 F6S is the platform for managing applications, related community and reach activities for more than 7000 Startup accelerator programs, Incubators & Startup Events around the world. F6S’ global penetration in the Accelerator segment exceeds 98%. More then 700 of these entities are EU-based. Almost a thousand early-stage startups in Europe receive initial funding and/or mentorship through these programs through the F6S infrastructure. Eurokleis is a SME born in 2000 with the aim to transform the research experience of its founders into specialized strategic consultancy and research studies with the focus on the use and the deployment of Information, Communication & Media Technologies. Eurokleis has developed different skills within the technology e- Science context. This is a key element of success of Eurokleis research, which give a high value to the diffusion of research results and for the transfer of technology activities on the market. Eurokleis relies particular attention on economic, financial and organisational evolution of technology. The core business of Eurokleis is research, development and deployment of highly specialized mathematical and computational models able to solve daily business problems. Eurokleis partners have worked for a number of international companies, local authorities and private organizations, as well as with the European Commission. 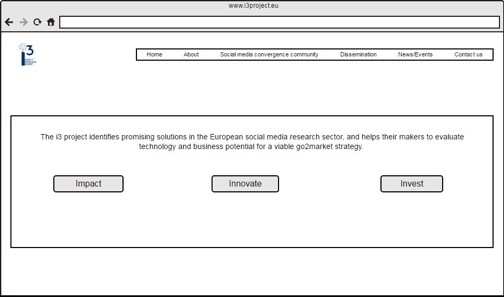 The I3 methodology for social, economic and technological impact and the self-assessment for ICT-19 projects in the Social Media and Convergence domain that will be used, draws its roots from previous projects. Notably, these include SEQUOIA, ERINA+, MAXICULTURE and IA4SI. The methodologies developed for these projects have been developed in accordance with the EC. They thus represent the foundation of the overall I3 framework and offer decisive lessons learned, which are being incorporated in the I3.The results achieved in these projects reflect in the planning of our activities, workshops and conference of the i3 project. Here are the main past projects on which i3 builds further (for more information about the projects, please consult Annex II). IA4SI supports and offers opportunities for knowledge exchange and synergies development to CAPs projects. It does so by adapting well experimented socio-economic impact assessment methodologies to the specific field of digital social innovation; offering three online tools for impact self-assessment, enabling projects to understand and improve their impact. OPTET plans through a multi-disciplinary and integrated approach to identify and address the drivers of trust and confidence also fight against its erosion (especially true on the Internet or Cloud). MAXICULTURE, (FP7) was a Support Action aimed at maximising the impact of EC ICT projects funded in the cultural domain through the adaptation, testing and transfer of a socio-economic assessment methodology. SEQUOIA was a support action (FP7) which developed a self-assessment socio-economic methodology in the area of Software as a Service and Internet of Services. ERINA+ was a support action (FP7) which developed a methodology to assess the social, economic and political impacts of the e-Infrastructures and of the projects that have been funded by the homonymous programme. The project DIGISTART aims to provide a supporting European Wide ecosystem for helping Web Entrepreneurs especially University Students navigate through the challenges by supporting and connecting them to the right resources. The aim of the project STARTUP SCALEUP is to build a European ecosystem around four consolidated entrepreneurial ecosystems in Spain, the Netherlands, Lithuania and Ireland and the largest social network for startups in the European Union (F6S), in order to provide a greater range and quality of services to ambitious entrepreneurs who want to launch and grow companies focused on the Internet of Things and Services (IoTS). As it can be noted, the i3 project relies on the interaction with ICT 19 projects. Working with these projects will enable the project team to develop and use the i3 methodology, and provide an assessment kit for the projects to use, in order to measure their impact. The list of the projects that will be engaged can be seen in Annex III. Defining the target groups is a key component, vital for the dissemination strategy. Target groups are the recipients of the project results and can act as agents for dissemination further in the project implementation activities. In order to achieve the overall project goal of i3 different type of target groups need to be engaged. Each target group has its own sphere of communication. By utilizing dissemination tools and key messages we can reach each target group effectively. Innovation oriented stakeholders and similar projects are targeted because they will enable improvement and validation of the ICT19 methodology. They will be also participating in the coaching and mentoring process of the projects. The target group labeled as “Society” refers to policy makers, NGOs, artists and research institutions. Their feedback on the methodology for engaging ICT 19 projects and toolkit functionalities will help shape future project activities. Business partners as well as private investors will have profound influence in the review of entrepreneurial capacities of projects, offer guidance for project ideas, but ultimately invest in those ideas as well. Media will be engaged not only to disseminated the information to the wider public, but also participate in discussions about policy issues. The following table provides a general overview of the target groups that will benefit from the project activities. For a better overview, the target groups are grouped in 3 stakeholder categories with included internal stakeholders. Internal stakeholders– which refers to the members of the consortium that are directly involved in the project management and planning. External stakeholders– which refers to the end recipients of the project outcomes, but will also act as opinion makers. Other – this category refers to the other projects with which the I3 project will have collaboration and foster interconnectedness. Once the specific target groups are collected, the dissemination plan can proceed with sending key messages. Overall, key messages are the project results, activities, budget and other defined in a clear manner that contain the most relevant information. Key messages are an integral part of the dissemination strategy as they will encourage the stakeholders to participate. The key messages will be adapted to each target group. While developing the key message to each target group, attention will be focused on the 1) length of the message 2) balance of information. As mentioned in the Introduction, our dissemination strategy will present the methods that will engage the target groups mentioned above. This section will start with the presentation of the visual identity of the project, after that focusing on the dissemination tools that will be used from the partners. The section starts with the overall description of the tools and how they will be used for each target group. Specific approach for each target group is essential as it will enable faster and more effective dissemination of information. If the dissemination process faces obstacles, the dissemination strategy will be adapted accordingly. Startup Europe Initiative is a European Commission initiative which aims at encouraging entrepreneurship and improving framework conditions for tech startups in Europe having in mind it will contribute to innovation, growth and jobs in Europe. 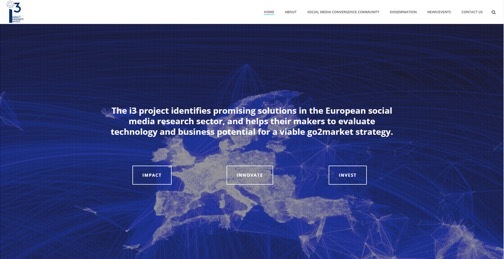 The objective of the i3 project is to identify the emerging promising solutions and their feasibility in the convergence and social media sector within the European research ecosystem. In the light of this the project will aim to cooperate with other European actions such as Startup Europe. This will be done through the F6S platform, but also with the networking and cooperation with projects that are under the auspices of the Startup Europe initiative. 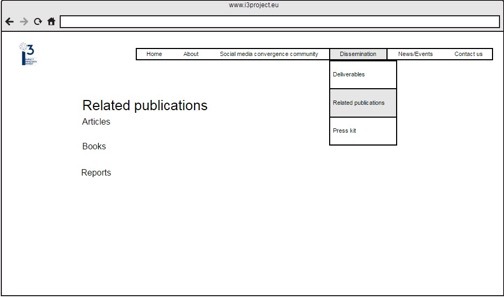 The i3 website will serve as the main point for dissemination of information, material and connecting target groups. The website will have specific sections allocated to information regarding the project dissemination (overview of research articles, white paper etc.) 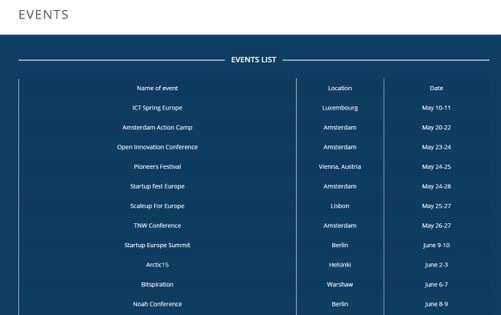 overview of ICT19 projects, events calendar, press kit etc. The website will be filled with content by the partners and the implementation of the project progresses. The Website Concept report contains a detailed overview about the layout of the design of the website, wireframes and descriptions of the menus with future plans of development. 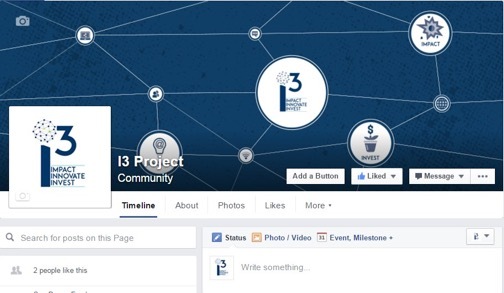 The visual identity of i3 has been developed on the basis of the project logo. Additionally, illustrations were made to graphically visualize the projects goal in a creative way. On the basis of these illustrations, their type and color selection, future graphical products will be developed. Various tools will be utilized to disseminate the key messages to the identified target groups. From the table it can be seen how each target group will be engaged. For the initial stages of the project, two visualizations will be made. The first one will be a brief presentational video about the project and what it aims to achieve. The second visualization will be for the methodology D2.1 Brief Description of Methodology. When the need will arise for dissemination of project results and information, press releases will be made and distributed to media channels that will be agreed among the partners. This section will include journal papers, white papers, newsletters and etc. These publications will be collected and posted on the web site, classified by categories. Newsletters will be also used as an effective way of disseminating results from activities but also inform about future events. 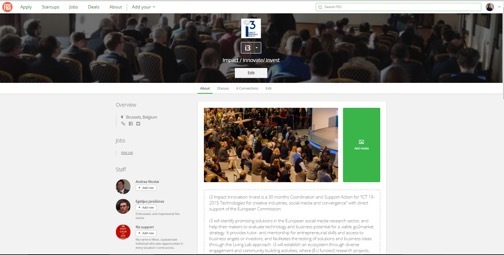 The project website www.i3project.eu will serve as the main hub for project dissemination. More information about the features of the website and plan for future development can be seen in Annex 1, Website Concept Report. – Coach and support candidates in developing their business idea and acquire the needed knowledge to negotiate with potential investors. Moreover, the project will also focus on coaching and mentoring activities through the organization of several masterclasses within the Social Media and Convergence projects. business idea, and Policy Recommendations. In order to increase the awareness of the target groups about i3. A portion of these materials can be hosted on the i3 webpage or they can link to the i3 website if they are featured on other sites. The tutorials will promote the dissemination in academic and entrepreneurial context. Dissemination events in the area of social media and convergence will be important as they act as places to establish presence, build liaisons and engage key stakeholders in the social media ecosystem. A Table as an example has been prepared by F6S which contains information regarding events, conferences with details such as date, venue, contact info about the organizer and whether a partner will attend. This sample Table will be a “live” document, updated according the strategy of the consortium and priority of events. Delivering the results of the project as well as information about activities and events it is crucial to utilize social media. The project will therefore seek to engage and retain its audience through Twitter, Linkedin and Facebook. Twitter as a platform enables to quickly disseminate short messages and target specific groups of audiences. This platform was chosen firstly to disseminate information about the projects. Secondly it provides a space where the i3 project can interact with ICT19 projects. Lastly it will enable to disseminate real time information from workshops and events. Linkedin was also selected to be used as a social platform due to the fact that is one of the largest platforms for business owners. The networking opportunity that this platform gives enables to target specific stakeholders that are relevant to the project activities. As Facebook remains the most popular social network, the profile that the project created will aim to target specific demographic and promote the project activities. F6S is the largest and fastest growing social platform for founders and startups. With over 1 million users and over 200.000 startups F6S has become the #1 startup community globally. Additionally, through F6S I3 will be able to reach 250.000 users and 30.000 startups/SMEs in Europe and more than 7.000 investors. Biweekly meetings with the consortium will be made to track the progress of the activities, discuss future plans and issues. 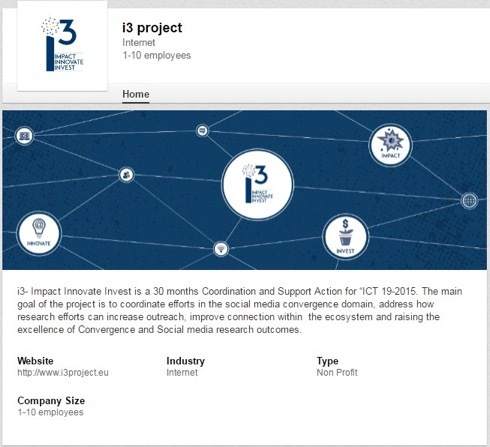 The project i3 Impact Innovation Invest is a 30 months Coordination and Support Action for “ICT 19-2015 Technologies for creative industries, social media and convergence” with direct support of the European Commission. In accordance with the Commission’s interest and the European Council’s conclusion that “Europe needs an integrated approach from research and innovation to market deployment”, our action will bridge a gap, increasing research projects’ outreach and impact. 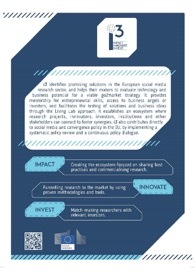 i3 will identify promising solutions in the European social media research sector, and help their makers to evaluate technology and business potential for a viable go2market strategy. It provides tutor- and mentorship for entrepreneurial skills and access to business angels or investors, and facilitates the testing of solutions and business ideas through the Living Lab approach. 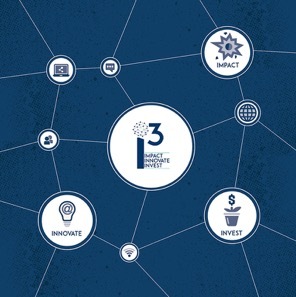 i3 will establish an ecosystem through diverse engagement and community building activities, where (EU funded) research projects, innovators, investors, institutions, media and other stakeholders can connect and foster synergies. i3 will also be in a position to directly contribute to social media and convergence policy in the EU, by implementing a systematic policy review and a continuous policy dialogue. 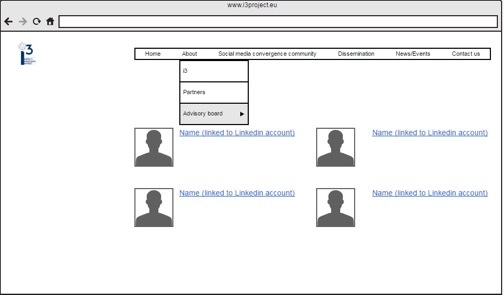 This report concerns the website for the project, www.i3project.eu. The report will provide a short overview of the concept, design and include wireframes for the website. The reasoning for the creation of the website is to deliver a platform that will be easy accessible for any parties that will be interested into reading about the project and engaging into its activities. During the implementation process the website will be regularly updated with news, gallery of photos and information for the press. The overall design of the web site is meant to be a simplistic one, focusing the attention of the reader to the project background. The website is intended to attract audience in the sphere of social media research, business and startups, and encourage their participation in the project activities. Furthermore, the website will offer relevant stakeholders a convenient place where they can receive regular updates regarding the project activities, view photos from events and access articles that were posted in the media. 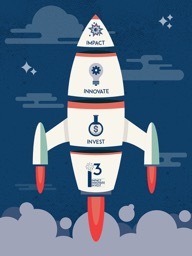 The core of the website is highlighting the elements of Impact, Innovate, Invest which are the pillars of the project. The website has included each segment in the top row where the reader can receive more detailed information about each subject. Provide free access to all courses and materials produced during the project. Since the project intends to reach different target groups, the website has been developed in order to address the specific needs of each target group. Together with the Dissemination and communication plan it is expected for the website to and engage the specified target groups to follow the project activities closely. The table below specifies the 5 target groups that the project will engage through its website and describe why they are engaged. The front page contains a short one sentence that provides the reader with an intro to the i3 project. In order to maintain the visitor’s interest, the front page also features 3 buttons Impact, Innovate and Invest. By clicking one of those buttons the visitor will be directed to a page with more information. If the visitor is interested into reading more about the project he/she can click on the menu above. At the bottom of the page, the footer is divided into several sections that can be customized at any point. For the current needs, the footer contains information about the address and contact info for the project, social media icons and information that the project is funded by the European Commission. If a visitor clicks on one of the buttons of Impact, Innovate or Invest he/she will be directed to page that will contain more information about that specific segment. During the later stage of website development a sidebar will be activated which will contain more information and links to research paper that are specific for that area. The Partner section of the website offers an overview and short information about the partners of the project. Additionally, under the description of each partner, a team member will be added with a photo and a short bio. The advisory board section will have the information of all the members of the board. Each member will have a photo accompanied by a short biography, when clicked on the name. Additionally, their names will be linked with their LinkedIn accounts. 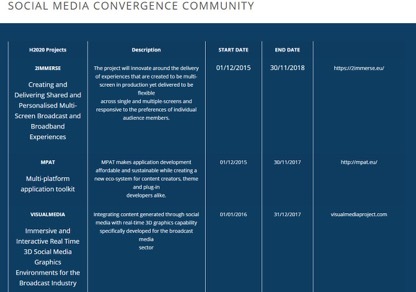 The Social media convergence community section features a list of ICT 19 projects. As mentioned in the Dissemination strategy, the I3 project will interact with these projects. Therefore the list provides a short description about each project, the start and end date and a link to the project’s website. The Dissemination section will function as a place where all materials will be available for read and download. 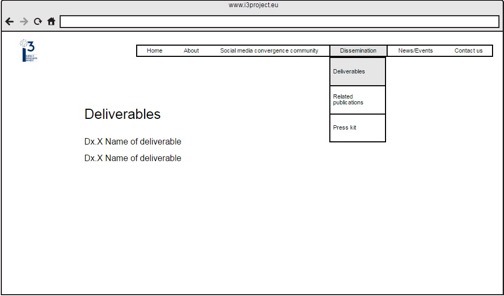 This section is divided in several parts in a dropdown menu: Deliverables, Related publications and Press kit. The section with deliverables will feature all the deliverables of the project. 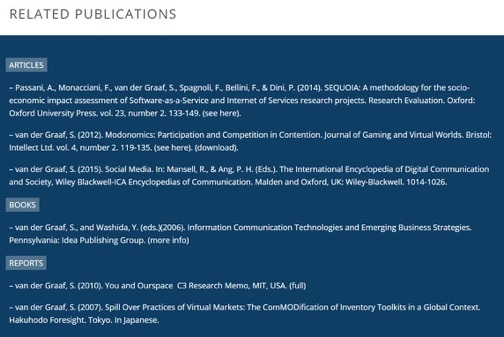 The Related publications section will feature items such as books, articles and reports that are related to the project activities. In the press kit section, i3 will upload all official press releases with the most recent ones on top. This will provide media and other interested parties to have a quick access to the desired information which can be easily share on social media channels, print media and TV. This section will also have high resolution files of the official project logo and the flyer for download. In addition this section will have links to the articles/information of project activities that will be posted on media channels. 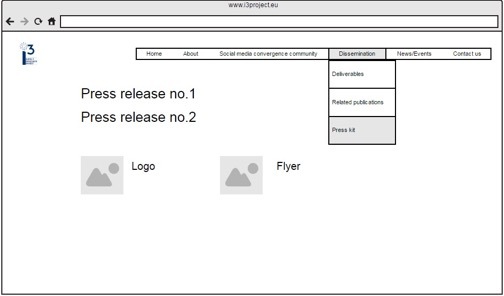 The following wireframes will demonstrate how this section is planned. The News/Events section is divided in 3 parts: I3 news, Events and Gallery. I3 news will list all the news like in Wireframe 6, with a photo in the preview so that it can capture the interest of the readers. The events section will list events that are of importance of I3, since I3 will aim to organize its workshops around the time of those events so that it can gather relevant stakeholders. 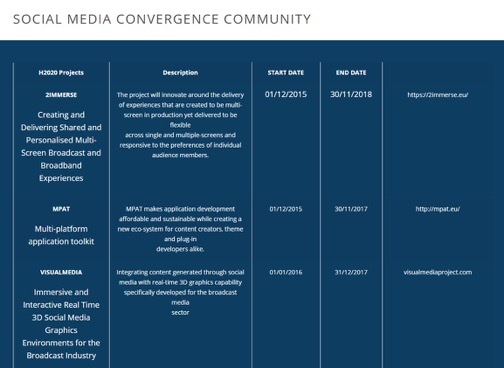 The event list will be updated on a biweekly level and it will feature events in area of social media convergence, innovation, entrepreneurship and media. A separate section of the web site will have a gallery where all the photos will be arrainged according to events and dates. 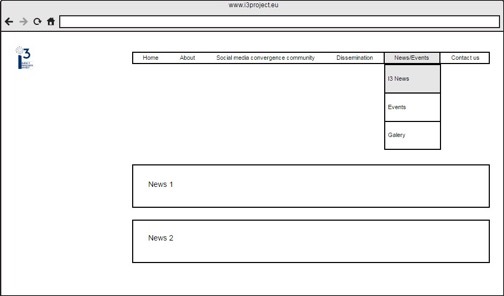 When a user visits the web site, a pop up will appear asking for the user whether he/she would like to receive a newsletter that will incorporate the news of the project activities. To ensure quality in the content of the website, the consortium will have weekly meetings through Skype or telephone until the website will be prepared to its full potential. All other related matters to the web site will be discussed during regular consortium meetings. On each Consortium meeting, a portion of the meeting will be focused on dissemination and communication activities. If there is a need for a separate discussion for a website meeting this will be arranged between the partners. Following the project proposal it is envisioned that information about the i3project should be disseminated through the usage of the F6S platform. It was evident that a separate website is needed. A standalone website is better equipped to provide media channels and visitors with a place that can address the activities which will be carried out by the project. In this regard, the design of the website and implementation of technical changes to suit the needs of the project have resulted with a delay in the deliverable. However, since these main changes have been integrated, the expectations of delays in the web site development future stage are at a minimum. The materials will be categorized by Theme and will have documents as .pdf files, videos and animations. This section will also have a search function which will enable users to quickly find the materials they needed. The Ecomac VRT-medialab study The Ecomac VRT-medialab study (“Towards an ecosystem for media innovation in Flanders”) (2010 – 2011) analysed how policies promote digital innovation in the Flemish audiovisual sector and provided recommendations on how such policies should evolve. MAXICULTURE (www.maxiculture.eu) MAXICULTURE, (FP7) was a Support Action aimed at maximising the impact of EC ICT projects funded in the cultural domain through the adaptation, testing and transfer of a socio-economic assessment methodology. The MAXICULTURE project built on previous experiences where project partners developed and applied a socio-economic impact assessment methodology in different ICT project domains and adapt the development methodologies to DIGICULT domain. The project also provided projects in the DIGICULT domain with a web toolkit for impact assessment and consultancy support aiming at better planning their sustainability, transfer and exploitation plans. 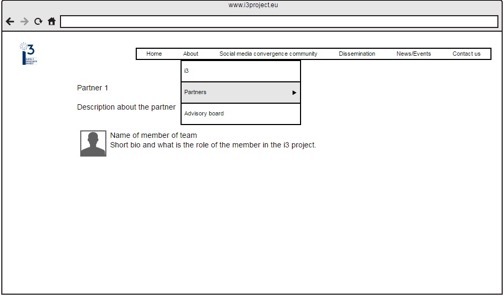 T6 coordinated the methodology development and carried out the assessment of the EC ICT projects at project and aggregate level, including the social network analysis of project collaborations. T6 was also responsible for the selection and analysis of DIGICULT best practices. SEQUOIA SEQUOIA was a support action (FP7) which developed a self-assessment socio-economic methodology in the area of Software as a Service and Internet of Services. T6 ECO was the scientific coordinator of the project and participated in the development of the methodology, in particular regarding the social impacts aspects: knowledge creation and diffusion, social capital, employment and working processes and fulfilment of the Social Agenda 2020 objectives. T6 ECO was also involved in the support activities for the effective assessment of app. 25 projects in the SaaS and IoS area. T6 was also responsible for the relationship with the projects in the area. ERINA+ ERINA+ was a support action (FP7) which developed a methodology to assess the social, economic and political impacts of the e-Infrastructures and of the projects that have been funded by the homonymous programme. The developed methodology involves the stakeholders of the sector: developers of research digital infrastructure and their users, the European research agencies and other funding organisation. T6 participates in the development of the methodology, especially regarding the aspects linked to social impacts. In particular, T6 was responsible of the impact assessment of eInfrastructures in reaching the objectives of the ERA (European Research Area) programme. To carry out this task, T6 ECO experts used the Social Network Analysis that enabled them to understand the extension, geographical distribution and relational flows among the major actors of the area. T6 was also extensively involved in the engagement activities of the project. TESS TESS (http://www.tess-transition.eu/) (FP7) aims to illustrate the role of community based initiatives in creating a sustainable, low-carbon Europe. It is supporting policy makers by contributing to a better understanding of how initiatives can become more successful. T6 contributed to the development of the assessment methodology, namely the sections related to social innovation and carbon accounting. Moreover, T6 was in charge of the mapping and assessment of online initiatives. T6 contributed to the mapping of Community Based Initiatives in Rome and the data gathering activities. T6 is in charge of the TESS dissemination, communication and engagement strategy and set-up the project website and other dissemination tools, within the project is developing a stakeholder communication tool mapping grassroots initiatives and support their networking. LIFE The LIFE project, led by Startups.be, is about collaborative learning from failure in entrepreneurship and collaborative actions to bring entrepreneurship forward. Although cultural diversity is one of Europe’s biggest assets, it also creates severe obstacles for entrepreneurs to scale their efforts at the pan-European level. The distributed markets, language barriers and decentralized policy leads to lack of access to talent and relevant expertise, sufficient financing and adequate facilities and networks. Hinged on a yearly Failing Forward conference, the project will map out all the relevant stakeholders and programs in each of the partnering areas in a systematic way, making this available to all web entrepreneurs across Europe in one centralized platform and identify, share and discuss best practices and success stories. Invest Horizon InvestHorizon is a project designed to increase investments made in Innovative European SMEs through Investment Readiness development and Investor sensitization. InvestHorizon will address the main challenges affecting investment readiness: the lack of programmes addressing investment readiness across Europe; the low awareness regarding investment readiness and financing options amongst entrepreneurs; the weak interest of different investor types for innovative SMEs across the technology sectors; the weak investability of many of the companies and presentational failings, and; the difficulty of matching innovative companies with specialized investors. COGNITUS Deliver innovative ultra-high definition (UHD) broadcasting technologies that allow the joint creation of UHD media exploiting the knowledge of professional producers, the ubiquity of user generated content (UGC), and the power of interactive networked social creativity in a synergistic multimedia production approach. InVID Build a platform providing services to detect, authenticate and check the reliability and accuracy of newsworthy video files and video content spread via social media. MPAT MPAT makes application development affordable and sustainable while creating a new eco-system for content creators, theme and plug-in developers alike. 2IMMERSE The project will innovate around the delivery of experiences that are created to be multi-screen in production yet delivered to be flexible across single and multiple-screens and responsive to the preferences of individual audience members. HBB4ALL (621014) – Hybrid Broadcast Broadband for All The project addresses media accessibility possibilities in the new hybrid broadcast-broadband TV (HbbTV) environment. SAM (611372) – Dynamic Social and Media Content Syndication for 2nd Screen Aims to develop an advanced social media delivery platform based on 2nd Screen and Content Syndication within a Social Media context. UCN (611001) – User-Centric Networking New communication paradigm that leverages user information at large to store, discover and deliver content in the most optimal conditions at any time, for a given user in a specific context. NUBOMEDIA First cloud platform specifically designed for hosting interactive multimedia services. CrowdRec (610594) – Crowd-powered recommendation for continuous digital media access and exchange in social networks Pioneering a breed of algorithms that combine crowdsourcing and recommendation algorithms to achieve a new generation of social smartfeeds for access and exchange of digital media in social networks. 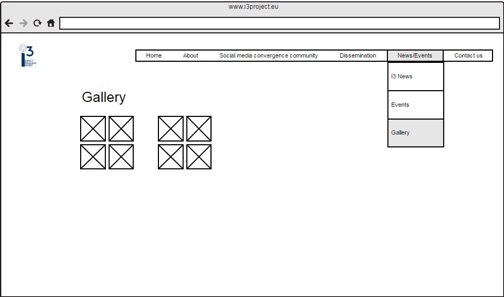 COMPEIT (611324)- COnnected Media and Presence from European Institute of Technology It creates a web-based system for highly interactive, personalised, shared media experiences. FORWARD (325135) – Framework for a EU-wide Audiovisual Orphan Works Registry Aims at a comprehensive, effective approach to the complex issue of AV rights assessment and Orphan Works. MediaScape (610404)- Dynamic Media Service Creation, Adaptation and Publishing on Every Device Lay the foundations for advanced connected multi-user services via a standardised approach integrated into the HTML5 paradigm. The project also seeks to facilitate the marriage of the TV, PC and Mobile worlds. ICT 19 projects are crucial to i3 as our work and goals will be focused on specifically addressing the objectives of the ICT 19 projects. A detailed list is included in the Annex, and for a more in-depth overview please read D3.1 Current Situational Analysis and Conceptual Framework.